A Kalamazoo, Mich., TV station has drawn attention to safety concerns with aftermarket parts in the home state of the auto industry. 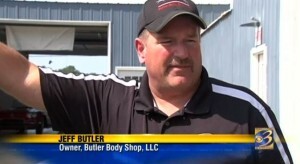 The report posted Wednesday by WWMT features Jeff Butler of Coldwater, Mich.-based Butler Body Shop (which has an endorsement from Ted Nugent!). Lourin Sprenger’s coverage calls him one of 16 plaintiffs in Michigan litigation against insurance companies, probably a reference to the Western Michigan District lawsuit Rodenhouse et al v. State Farm et al. That case does raise safety concerns about aftermarket parts, though the actual complaints focus on alleged insurance steering and antitrust violations. Butler in the WWMT broadcast is amenable to cosmetic aftermarket parts, but challenges aftermarket replacement of components like fenders which, while not necessarily part of the body in white, can have a safety function. “That’s designed that, in a wreck, this fender’ll fold up like an accordion,” he tells WWMT in the broadcast. “We need to put an OE part in there so we know what’s gonna happen in the chain of events so that the airbags and the safety items do what they’re supposed to do,” he also says. That concept was also raised in a 2010 Consumer Reports article citing Ford research. That coverage described findings for an aftermarket bumper beam and structural radiator support, both parts which Ford knew could affect airbag timing. “Engineers found that the non-Ford crash parts performed differently than the original Ford parts and produced a shift in timing that would affect air bag deployment,” Consumer Reports wrote. What’s also troubling about that study is that the aftermarket parts didn’t match the light, strong material of the OEM versions. See more of our coverage here. Butler told the station he’ll eat the difference between OEM and aftermarket parts in instances where he feels there’s a safety function to the part. Sprenger also observes in the broadcast that “there’s no crash testing standards in place” for the aftermarket industry. State Farm in response offered the station variation of the statement it has provided to media, including Repairer Driven News, in stories about the lawsuits. “These accusations are not in line with the State Farm mission to serve the needs of its customers, and our long, proud history of achievements in advancing vehicle safety,” State Farm told WWMT. “… A vibrant, profitable auto collision repair industry is in the interest of State Farm. At the same time, we are advocates on behalf of our customers for reasonable repair costs. We believe repairer profitability and quality auto repairs that are reasonably priced can both be achieved. The WWMT story also references a Michigan bill to clamp down on aftermarket parts, but attorney Andy Rodenhouse criticizes it in the report as “ambiguous at best” and lacking a penalty. However, Senate Bill 443 — presumably the legislation referenced — does seem like a repairer wish list, banning aftermarket parts including “a bumper reinforcement, radiator or core support, or any other part that affects the structural integrity or airbag timing of the automobile,” and banning certain other long-criticized insurance practices related to rates and paint and materials. The bill introduced earlier this month fines insurers the greater of three times the amount in question or $500 plus attorney fees and is loose about who can join a class-action suit related to the violation.